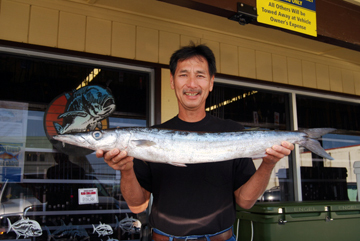 Carl Okamoto was fishing outside Kapalana when he got a bite on his Penn 12/0 reel. He cranked in the 100-lb test line and found a huge kawele'a on his hook. It beat the current state record by nearly 3 lbs and was caught on Carl's homemade rod.